Nikon has announced its latest enthusiast camera in the face of the D5500 – the first DSLR by the Japan-based company with a touchscreen. Skipping over the D5400 (out of superstition perhaps), Nikon’s D5500 adds a few improvements over its predecessor D5300 – a new fully touch-enabled articulating 3.2″ 1,037,000 dots screen, redesigned control dial, more ergonomic grip, proximity sensor above the viewfinder that turns off the LCD, full ISO range of 100-25,600 and a body that’s slightly smaller and lighter. 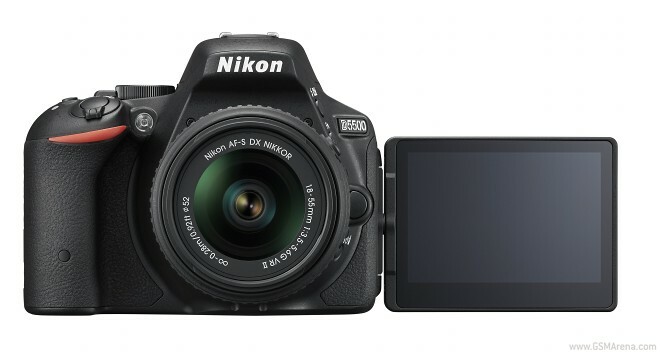 The rest of the specs are more or less in line with the D5300, which could now potentially become a sweet deal. Both cameras have a 24.2MP APS-C sensor without a low-pass filter (meaning sharper images), the same Expeed 4 processor, 5fps continuous shooting, 39-point autofocus system with 9 cross type points that has carried over from the D7000 and is featured in the D5200, minimum shutter speed of 30s and maximum of 1/4000s, same battery (although with a claimed higher 820 shots vs the 600 shots of the D5300) and the same 1080p@60fps movie recording. The new touchscreen interface will allow you to interact with the shooting settings as well as either choose a focus point or directly touch to capture in Live View mode. The Nikon D5500 follows in the footsteps of the higher-end D7000/D7100 series and moves to a fully black shutter button and also adds a flat picture profile for those that want to work on the colors in post production. The built-in GPS of the D5300 has been lost but the Wi-Fi connectivity is still on board. Alongside the D5500 Nikon also introduced a new AF-S NIKKOR 300mm f/4E PF ED VR lens that’s the world’s lightest in its length and a new, smaller AF-S DX NIKKOR 55-200mm f/4.5-5.6G ED VR II with a retractable design. The Nikon D5500 will be available in February for $799 body only, $999 with the Nikkor 18-55mm f/3.5-5.6G VR II or $1,199 with the AF-S DX NIKKOR 18-140mm f/3.5-5.6G ED VR. The new AF-S DX NIKKOR 55-200mm f/4.5-5.6G ED VR II will cost a reasonable $350 while the AF-S NIKKOR 300mm f/4E PF ED VR packs a premium of $1,200.